We’d love your help. Let us know what’s wrong with this preview of Mr. Neutron by Joe Ponepinto. This is an advance reader copy. Gray Davenport, a veteran political operative, isn’t faring much bette This is an advance reader copy. To ask other readers questions about Mr. Neutron, please sign up. I'm working with the author to help promote this novel in advance of its release date in March. If you're ready to read a satirical novel with equally fabulous doses of dirty inside politics, quirky candidates, and secrets of ... um... frankensteinian proportions, this is your bag right here! It's just the thing you need to escape from our current f-ed up times. If you want a digital review copy, send me a message and we'll hook you up! It couldn’t be real. Just couldn’t. Besides, if someone brought a cadaver to life today, it would be under controlled circumstances—in a lab at some university, with the media and religious protesters in attendance. It would go viral on the web. He would have heard about it. Still, Gray couldn’t dismiss the possibility. His timid psyche often cleaved to the supernatural, if only to explain the failures in his life. And dead men had been elected before, although they typically stayed in their graves and didn’t campaign. Before I get into this -- yes, this is a political satire. But it's pretty apolitical. There are almost no political points made, few actual policies advanced or discussed, and certainly no mainstream parties are either pilloried or lauded. The satire is of this strange thing called American politics -- the campaigns, the process, the press, the people involved. Conservatives, liberals, statists, libertarians, and everyone in between can read this safely without worrying about getting much tweaked by the book. In the opening paragraphs we meet Gray (Davenport, we're later told) and Reason Wilder. Gray is running a mayoral campaign and one of his candidate's opponents is Reason. Right away, you can tell this book isn't going for subtlety. We later meet Patsy Flatley (the advisor to Gray's candidate), The Reverend Inchoate Hand, Breeze Wellington, and Randy (of various last names) -- all of these names tell you a good deal about these characters (and I could've listed other examples). Ponepinto lays his cards on the table right away when it comes to his characters and the type of people they are. Reason isn't the best funded, most articulate, or most polished candidate -- but there's some impossibly strong magnetism about him and his simple promise that “Together we will do great things for this city," without ever giving a specific idea how they'll do that, or what a great thing might be. Virtually everyone who encounters Reason falls under his spell but Gray. Not only does Gray maintain some sort of skepticism about Reason, he notices a disturbing odor about him, the way his body doesn't seem to work together organically, and frankly, doesn't seem to belong together. It's almost as if someone stitched him together from spare parts. Once Gray starts speculating down that path, he becomes convinced that's the case -- and sets out to prove it. Along the way, this effort causes problems in his marriage (well, it brings problems in his marriage to a head); brings some powerful people into his life; and puts him in league with the strangest journalists you've probably encountered. This kicks off some overdue self-examination to go along with his hunt for information about Reason. All the while, the campaign goes on: Gray's duller than dull candidate tries to build a voter base, the well-funded front-runner has to work to remain relevant, and Reason's cult grows in a way no one can believe (or deny). We see a debate, a fundraiser or two, press conferences, polls, and money -- and the ways all of those can alter a campaign, especially the money. One difficulty I had while reading this book was remembering it was a satire -- Ponepinto's writing frequently comes across as highly-crafted and nuanced, and then he'll have someone named Randy do something filled with innuendo or something equally obvious or ridiculous and I'd have to remind myself I was reading a book about a Frankenstein's Monster-like being running for mayor, and perhaps I shouldn't take it too seriously. I do think that's a strength of the book -- I'd forget I was reading nonsense about impossible tings because the narration was just so serious. It is a funny book, at times, but not told in a way that underscores it, which somehow works. I didn't love the ending, honestly. But I absolutely get why Ponepinto did it -- and good satires rarely have satisfactory endings anyway. This was better than a lot of them -- for example, I've read almost all of Christopher Buckley's novels and there's only one of them that had an ending I can tolerate. So, "didn't love" is pretty good. I thought the last couple of paragraphs were far too preachy, and could've been cut without really harming the novel and/or its message. But before all that, we've got a very strange ride. You're not going to see a lot like this -- a little supernatural/monster, some pointed commentary on politics, a dash of romance, a nice friendship, and an odd collection of characters bringing all this to you. You should give it a shot. I have no idea what kind of follow-up Ponepinto might have in store, but I'm very curious. 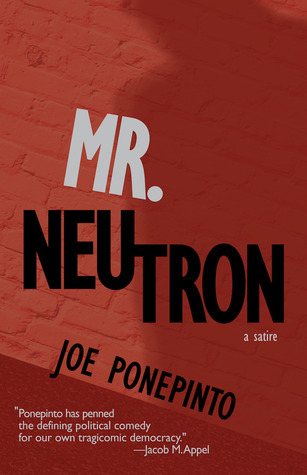 I had the opportunity to snag an ARC of Joe Ponepinto’s forthcoming novel, Mr. Neutron, in exchange for an honest review and I jumped at the opportunity. What struck me most about Mr. Neutron was Ponepinto’s ability to create such a timely political landscape; one that deftly questions the limitations of a democratic society. Ponepinto shines an intensely bright spotlight on how easy it can be for the few to manipulate the ideas and actions of the many. And he does it through his larger-than-lif I had the opportunity to snag an ARC of Joe Ponepinto’s forthcoming novel, Mr. Neutron, in exchange for an honest review and I jumped at the opportunity. What struck me most about Mr. Neutron was Ponepinto’s ability to create such a timely political landscape; one that deftly questions the limitations of a democratic society. Ponepinto shines an intensely bright spotlight on how easy it can be for the few to manipulate the ideas and actions of the many. And he does it through his larger-than-life characters that produce the kind of rip-roaring humor you’d expect in a brilliantly written piece of cutting satire. Mr. Neutron is a clever and entertaining read. I highly recommend it. I like this book. I laughed out loud when least expected. I shared one-line zingers with Sylvia and anyone around me when I found them. I found enough of them. This is not a page-turner; I doubt that satires would normally qualify. But it is a chapter turner. I would end a chapter and 'take a peek' at the next few lines until I realized I'd worked my way through the next half of the next chapter. Good stuff. But, like they say: dying is easy, comedy is hard. In no way would I put Mr. Neutron in I like this book. I laughed out loud when least expected. I shared one-line zingers with Sylvia and anyone around me when I found them. I found enough of them. This is not a page-turner; I doubt that satires would normally qualify. But it is a chapter turner. I would end a chapter and 'take a peek' at the next few lines until I realized I'd worked my way through the next half of the next chapter. Good stuff. But, like they say: dying is easy, comedy is hard. In no way would I put Mr. Neutron in the gut-buster category. Its strengths build up quickly through its quirky characters. I remember them and constantly found myself nodding my head throughout. Yup - I get that guy. Yup - I get the ball-sitter or nut-muncher or nose-picker, et cetera, et cetera. Ponepinto is a careful writer that neither second-guesses or talks-down to his audience. Neither does he spoon-feed or reiterate or ignore salient points in the telling. I mention this because I noticed this style tendency in his book Curtain Calls. While Mr. Neutron may not be Kobe Beef (I'll rate it five (4.5) stars to offset one reader's three (3.5) mark), but neither is it pablum. Mr. Neutron is billed as a satire. Ostensibly, political. But politics come in many shapes and sized, political, marital, relationship, economic, and so on. All of these are present and accounted for. The characters are so well fleshed out, not a one of them act as stereotypes. With the possible exception of the Muppet's Old Fart types, Statler and Waldorf - but they are worth the glaze. For me, the two stand outs are Gray Davenport and Reason Wilder. Gray is a political behind the scenes Everyman, which is about a dry a character as one could imagine. But his problems are real. The man he works for, Bob, stands no chance in the upcoming election. So why does he stay? Why doesn't his boss and ball-bouncing benefactor every listen to him, yet keep Gray on the payroll? Ponepinto gives Gray a voice that sings and it's fun to listen to and read. Then comes Reason Wilder, the Frankenstein wanna-be contender . . . or is he the real deal? Why do people flock to Reason, when all he has to say is the usual dry political rhetoric. Sound familiar? Mr. Neutron is an uneven novel. The satirical elements rarely hit and are far too broad to be meaningful, but the story remains funny, entertaining, and Joe Ponepinto's prose is is well-crafted. I'd recommend this if you want a fun, humorous science fiction story. NOTE: I requested and received an ARC from the author in order to write this review. Mr. Neutron, Joe Ponepinto’s second novel, is a fantastical narrative that is evocative, meticulously researched, wry, and full of moments of impossibly beautiful writing. The author weaves speculative elements with lyrical prose, humor and satire, in a way that mirrors one of the central characters in the novel, Reason Wilder, an ‘undead’ 8-foot tall giant: each distinctive element is stitched together and elect NOTE: I requested and received an ARC from the author in order to write this review. Mr. Neutron, Joe Ponepinto’s second novel, is a fantastical narrative that is evocative, meticulously researched, wry, and full of moments of impossibly beautiful writing. The author weaves speculative elements with lyrical prose, humor and satire, in a way that mirrors one of the central characters in the novel, Reason Wilder, an ‘undead’ 8-foot tall giant: each distinctive element is stitched together and electrified, bringing to life a novel that made me laugh out loud many times, that made me think about what it means to name someone, and about how the minute pieces of ourselves can be just as twisted as the enormous undead giants we try to uncover in others and ourselves. The small town of Grand River is polluted, the city officials are corrupt, and the protagonist of Mr. Neutron, Gray Davenport is running a mayoral campaign for a candidate that he does not believe in. Reason Wilder, one of the candidates running in opposition to Gray’s client, is a slurring, gray-skinned, cadaver-like giant who likes to shake the hands of strangers and fans jostling for his attention at campaign rallies, and refer to them as, ‘My Friend’. Gray works throughout the book to expose Reason and Grand River’s politics for what they really are—malleable, fragile, subsisting on the vacillating and contradictory needs of constituents. In addition to the multitude of jokes woven into the narrative, the characters’ cheeky names teach the reader how to read the book, and remind us that this is a satire. On a craft level, a reader might appreciate how the brassiness of the names cleverly contrasts with the lyrical prose, the latter of which, in turn, elevates the speculative elements. Gray's unique journey in this novel speaks so much to the layered and multiple themes of the novel—in that satire that bites can also teach, that empty charisma mixed with empty beliefs can catapult anyone into society’s collective consciousness. And that an individual’s choice to work (as a campaign manager) for someone with no convictions can be dangerous. The novel teaches the reader what can happen when a person does not trust the strength of their own voice, who believes that subsisting behind the curtains as a self-doubting, insecure puppeteer (or as an 8-foot tall ‘undead’ giant), working for an empty-mouthed puppet is the only way to Be in the world. Mr. Neutron, Joe Ponepinto’s debut novel, is a biting satire about the craziness and politics that go into elections. Gray Davenport, the beleaguered, unpaid campaign manager f In a troubled election, Gray Davenport must prove that Reason is dead. Former journalist and campaign aide Gray Davenport is scouring the political scene in his town of Grand River only to discover that the favored mayor candidate may be Frankenstein-ish. Alone Gray sets out to prove his theory—that the favored opponent might be among the walking dead. The author has prose that I’ve admired for some time. Lines like this ring: “A pitfall of his outsider status. A pitfall of his lack of tribe, lack of affluence and fashion sense—his size forty Men’s Wearhouse off-the Former journalist and campaign aide Gray Davenport is scouring the political scene in his town of Grand River only to discover that the favored mayor candidate may be Frankenstein-ish. Alone Gray sets out to prove his theory—that the favored opponent might be among the walking dead. The political satire is timely—that’s obvious. Gray is an everyman, the Mr. Neutron, who is really “a mere particle floating in a plasma filled with objects of greater mass and energy than he.” But only at first. The neutron escapes. This is a tricky one to sum up. It left my head spinning. I liked this book. It was funny and clever, it had twists and turns I didn't expect, but it wasn't exactly a page-turner for me (and that's probably because political fiction with deep satire are outside my comfort zone, reading-wise). I think my favorite aspect of the book is the main character, Gray. I couldn't stand him! He's misogynistic, ableist, etc. Super cringey. But people are complicated, and the way the author portrays Gray real This is a tricky one to sum up. It left my head spinning. I liked this book. It was funny and clever, it had twists and turns I didn't expect, but it wasn't exactly a page-turner for me (and that's probably because political fiction with deep satire are outside my comfort zone, reading-wise). I think my favorite aspect of the book is the main character, Gray. I couldn't stand him! He's misogynistic, ableist, etc. Super cringey. But people are complicated, and the way the author portrays Gray really showed the depth of that. He's so very far from perfect, and that made him incredibly interesting. This would make for a very lively book club discussion if you're in a group that digs this type of novel! A fun read, Mr. Neutron will get you thinking at the same time as it entertains. Joe Ponepinto’s wit shines throughout. One of my favourite lines popped up when two characters shared wine in a hot tub. The wine was a white, of course, because “red doesn’t go with chlorine.” This book will appeal to readers who enjoy satire fueled by politics. I really enjoyed Curtain Calls and I was excited for Ponepinto’s latest. Mr. Neutron is totally original and effortlessly funny. Ponepinto makes the fantastical and absurd relatable, and his ability to put the reader into Grand River, and each setting within it, was masterful. I think Randy deserves his own spinoff story! I will be writing a review for the publication I work for, but just to give you a taste... could have been better. Overall I found this book to be an entertaining but ultimately only average read. I liked the storyline, the characters were well developed and the plot was easy to follow. Still something was missing. Maybe my problem with the book is I cared too much about the main character, Gray. Initially, he is portrayed as a lost soul. I especially liked the author's analogy describing him as an atomic neutron. Like the particle, Gray was neither positive or negative, had mass and took up space. He desired Overall I found this book to be an entertaining but ultimately only average read. I liked the storyline, the characters were well developed and the plot was easy to follow. Still something was missing. Maybe my problem with the book is I cared too much about the main character, Gray. Initially, he is portrayed as a lost soul. I especially liked the author's analogy describing him as an atomic neutron. Like the particle, Gray was neither positive or negative, had mass and took up space. He desired good things but ineffectively strove to influence and succeed. in the end, Gray appears ready to triumph but not in the way that I hoped. I confess that I would probably have like the book better if the plot had allowed Gray to make it on his own. Writing a review of this for Alt Current.